Are you afraid of the bees or yellow jackets? Have you ever experienced stings? Often, people get a bee or yellow jacket sting when contacting with them. However, there are some differences between bee stings and yellow jacket stings. If you experience inflammation and redness around the stings several hours after being stun; itching, fatigue, and heat around the affected sites, you may suffer from yellow jacket stings. Do you think that these stings are difficult to be treated and you need to go to your doctor or a professional medical care, right? If “Yes”, so don't worry about this. Be patient and read this article on Effective Remedies to find the best solution. In fact, when your condition is mild, you may completely use some natural home remedies for yellow jacket stings to deal with them easily. For mild cases of stings caused by yellow jackets, if you opt for natural treatments at home, ensure the stinger is taken out of the skin by simply pulling it away with one clean knife. After that, you cleanse the area with mild soap and water. 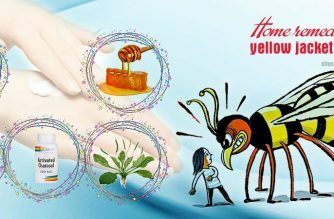 Then, try some of these natural home remedies for yellow jacket stings to remove the symptoms quickly. 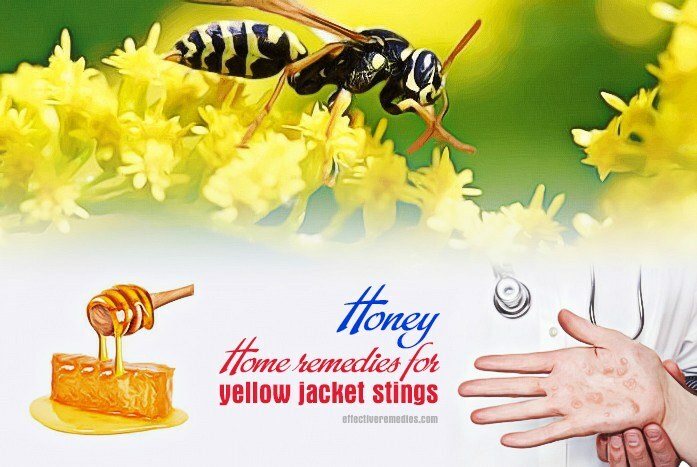 Now, let’s find out 11 best natural home remedies for removing yellow jacket stings that may be easily used at home. Applying a cold compress to the affected area is one of the quickest home remedies for yellow jacket stings because it helps to reduce pain and itching very effectively. So, remember that before putting anything else on it, think about a cold compress first. Besides, a cold compresses aids in reducing swelling & inflammation by numbing the nerve endings . According to a study in the “Clinical Techniques in Small Animal Practice” in 2006, using an ice or cool compresses and topical corticosteroid or lidocaine lotions helps to manage yellow jacket stings successfully. At first, add some ice cubes into a bowl filled with cold water. Then, put a piece of soft cloth in it. Now, remove the excess water and place the cloth on the affected area. After that, leave it on for about 10 minutes. Do 2 to 3 times, waiting for 15 minutes between each application. If needed, repeat several more times on the first day. You may also hold a bottle of cold water or a big bag of frozen vegetables on the affected area. Both apple cider vinegar and white vinegar work as effective home remedies for yellow jacket stings and other insect bites. The presence of acetic acid in vinegar contains anti-inflammatory effects that help to ease swelling and inflammation . Firstly, soak a clean cotton ball in white vinegar or raw & unfiltered apple cider. Then, hold this cotton ball over your affected area for about 5 minutes or more. Repeat the simple remedy as needed. Another option, mix 1 tbsp. of white vinegar or apple cider vinegar and an adequate amount of commercial meat tenderizer to create a paste. Now, apply the paste to the affected area for half an hour. Finally, rinse it off by using warm water. Repeat the remedy as needed. Honey is also considered another of the great home remedies for yellow jacket stings that offer instant relief from its symptoms. The enzymes present in honey are very effective in neutralizing the venom at the stings. This helps to ease the pain & itching within several minutes. In addition, it contains antibacterial properties that aid in preventing infection . Moreover, honey works for hornet and wasp stings. At first, take pure, raw honey and then spread it generously on your affected area. Now, leave it on for half an hour or until the honey gets dry. Finally, use warm water to rinse it off. You should use it as a normal lotion a few times a day for a few days. Another option, add honey to 1 tsp. of turmeric and mix them well to make a paste. Now, apply it to the affected area and allow it to dry. After that, rinse it off thoroughly with warm water. Repeat this method a few times a day for 2 days. Using activated charcoal is also one of the natural home remedies for yellow jacket stings. The innate absorption properties of the activated charcoal help to get rid of toxic substances from your body. After you have stings, using activated charcoal immediately help you to prevent swelling and pain . On a band-aid, you rub a wet charcoal tablet until it’s entirely black. Then, apply this band-aid to the affected area. You can replace it with another one after a few hours. Repeat the process as needed. Another option, empty the contents of two or three charcoal capsules into a clean bowl. Then, mix it with an adequate amount of water to create a paste. After that, apply it to your affected area for several hours. Finally, rinse it off by using warm water. Repeat the remedy, if needed. Or, you can consult a doctor to take activated charcoal capsules. Plantain leaves are recommended by many health experts due to their healing properties that give you a quick relief from the symptoms of yellow jacket stings. The anti-inflammatory effect of these leaves aids in reducing pain, swelling, & itching . In addition, the antibacterial property present in the leaves lowers the chance of an infection, which may delay the healing process. At first, extract the juice from some fresh plantain leaves by gently crushing them with your hands. After that, apply the juice to your affected area. Now, allow it to dry and rinse it off by using warm water. You can repeat the process 2 or 3 times a day for a few days. Or, you can apply a non-prescription plantain ointment to the affected area for a few times daily to promote a quick recovery. 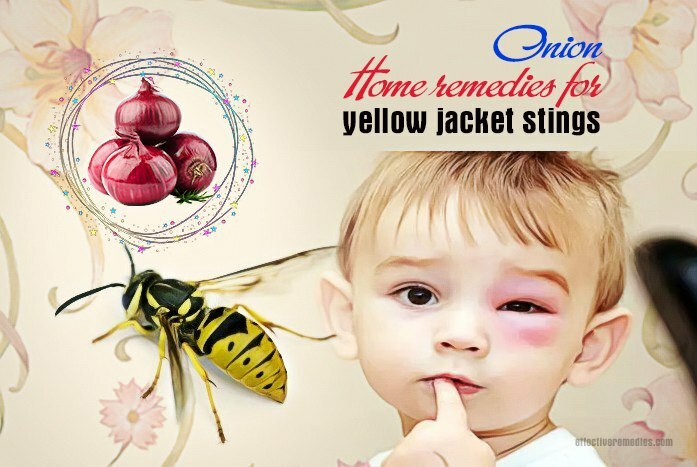 Using onions – a familiar ingredient in every kitchen is considered one of the effective & natural home remedies for yellow jacket stings that you should try. This spice helps to soothe the itching and reduce swelling caused by the small insects. In addition, the strong smell of onions repels the insects and protects you from getting further stings. Firstly, slice a raw onion and then rub it on your affected areas for a few minutes to let the onion juice do its magic. After that, keep the juice on the skin for 15 minutes and then rinse it off by using warm water. Remember to repeat this method as needed. Another option, you can put an onion slice on the affected area. Then, wrap it with gauze in order to hold the slice in place. Now, leave it on for half an hour and then remove it. Finally, rinse the area with warm water. You can repeat the simple way if needed. Using aspirin is also another of the highly beneficial home remedies for yellow jacket stings that you can easily perform at home. It is very effective in neutralizing the venom to get a quick recovery from the issue. In addition, it contains anti-inflammatory properties that aid in managing the pain and swelling. Besides, aspirin is also beneficial for the symptoms of stings caused by yellow jackets because it can inhibit the toxin and speed up the healing process. At first, mix 2-3 aspirins with an adequate amount of water to make a thin paste. Then, apply it to the affected area and let it dry naturally. Ammonia is famous for its alkaline properties in nature, so it may fight the acidic toxins in the venom and gives instant relief from the symptoms. By applying ammonia, you may easily relieve the stinging sensation and control the pain and itching. At first, soak a clean cotton ball in household ammonia. Now, dab it on your affected area. You can repeat this method when needed. Note: Before using this ingredient, do a small test on the skin to check for any sort of reaction. 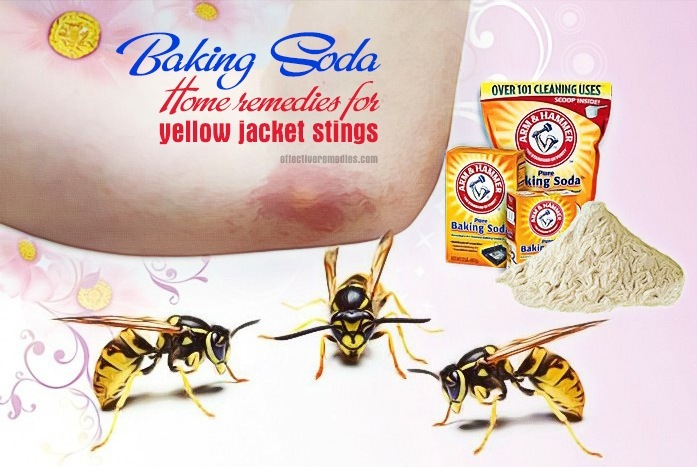 One of other effective & natural home remedies for yellow jacket stings is definitely baking soda. The alkaline properties of baking soda aid in neutralizing the yellow jacket stings quickly. This offers an instant relief from the pain and itching related to the stings. In addition, baking soda is an anti-inflammatory agent, so it may help to reduce swelling, redness, and inflammation. Let’s try using this method if you want to remove the stings safely and fast. Mix 1 tsp. of baking soda with an adequate amount of water to create a paste. Then, apply the paste to the affected area and wait for about 5 to 10 minutes. After that, rinse it off by using warm water. If needed, you can repeat it after a few hours. Do you know the reason why toothpaste is one of the incredible home remedies for removing yellow jacket stings? This is due to its ingredient that can enable to inhibit the toxins in the venom and reduce the symptoms of these stings quickly. However, you should use only white toothpaste and avoid using whitening, colored, or gel toothpaste. Firstly, take a little white toothpaste and dab it on the affected area. Then, allow it to be there for a few hours. Finally, rinse it off by using warm water. Repeat this simple method as needed. Witch hazel is a great astringent made from the bark and leaves of the witch hazel tree. When it comes to the ways witch hazel may help to calm inflammatory skin-related issues such as pimples, mosquito bites, wasp stings, bee stings, yellow jacket stings, etc. Thanks to its inflammatory properties, witch hazel is beneficial in reducing inflammation, swelling, and pain. This, in turn, helps you to get rid of yellow jacket stings soon. Simply, take a little witch hazel. Then, apply it directly to the yellow jacket stings. You can repeat this way as needed. When getting a sting by a yellow jacket, you should immediately move to another safe area to prevent further stings. Then, try to remove a yellow jacket carefully or wait for this insect to fly away. Don’t tug, pull or shake because it only makes the stings more aggressive. Immediately put enzyme-based meat tenderizer combined with a little water to neutralize the venom. Avoid scratching the itchy sting area because it introduces bacteria into your skin and then causes infection. Above are some of the unrevealed natural home remedies for yellow jacket stings that you should not ignore. These treatments are collected from reliable sources, so you can apply it without worrying about the side effects. 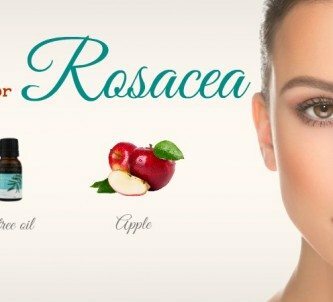 If you want to know the natural treatments for other conditions, please visit our Home Remedies page. Feel free to leave your thoughts at the end of this post.